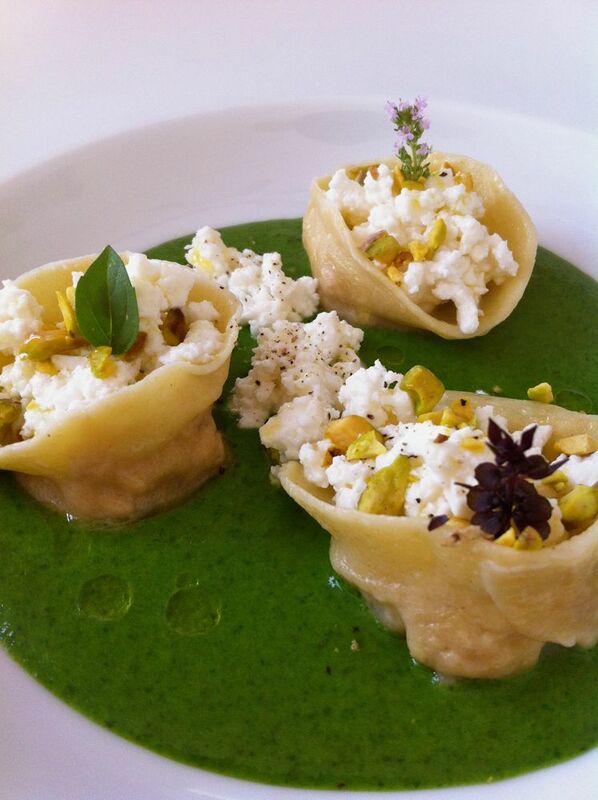 Who said that spinach and ricotta are only used as a filling for ravioli?! . Let's change the subject, put the house upside down and rewrite the ravioli!. 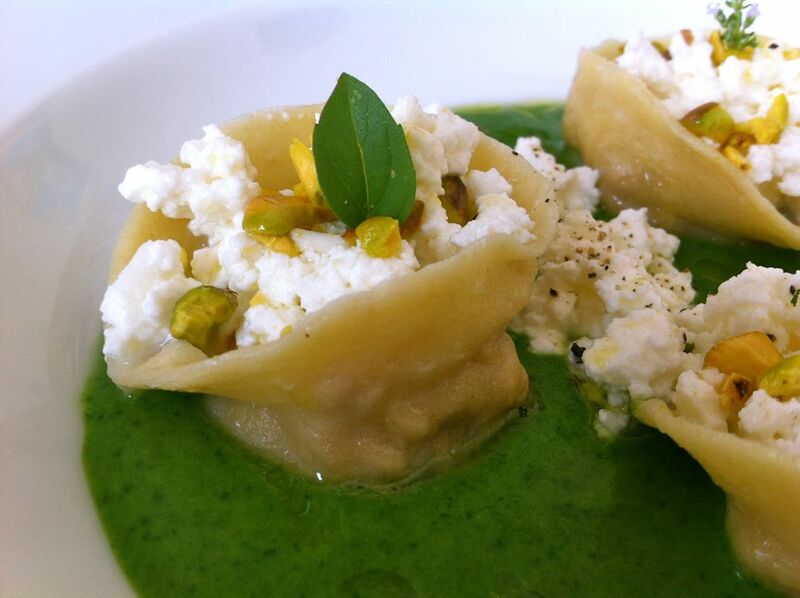 To begin the shape of the ravioli itself is reversed. 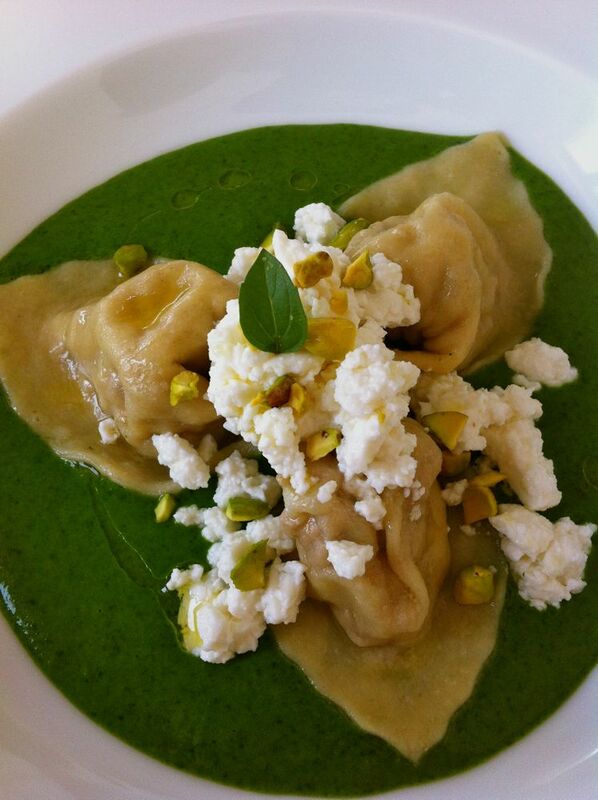 Called also ravioli a testa in giù (upside down). It's a mezzaluna shape ( half circle ) closed from the edges forming a sort of cap. Nice, funny and versatile form that allows you to top it up. 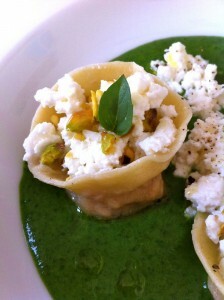 Today with fresh ricotta. 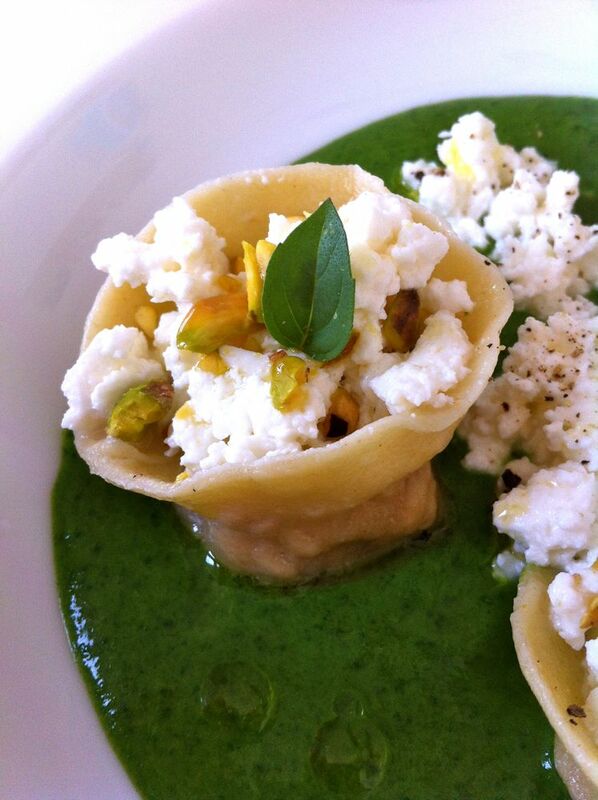 I also made classic tortelloni while I was there, but the firsts I loved most. The chicken is not really smoked, simply seasoned with a bit of essence of smoke in powder. Basically it is a free-range chicken ragout with white wine, herbs and lemon zest. The pistachio is not contributing with great taste for the little amount used, but it gives that nice crunchy touch. Take the chicken and mince it with a knife as if it was a steak tartare. Poach the onion with the garlic and add the meat. As soon as golden colour, season it. Follow the white wine, the smoke essence (at taste) and then cover with broth or water. Cook for 20 min. over low heat with a lid. Add the lemon zest and a teaspoon of cornflour (cornstarch) dissolved in a cup of coffee with cold water.Let the sauce to dry up a bit and turn off. When cooled add a handful of parmesan cheese. Stretch the dough and form circles of about 10 cm. . Add half a tbsp of filling, close as half circle, and then join the two corner to close (same as a tortellone) but with a close node and then overturned. For the cream of spinach: bring water to a boil and blanch the leaves for 5 seconds (no more) and cool them immediately in cold water with ice. This shock is a technique that allows you to keep alive the color of chlorophyll and not to lose too many vitamins and the flavor of the vegetables.Puree the leaves with shallots previously poached with a knob of butter. Add some of the cooking water if too thick. Assemble the dish to your liking, sprinkle with the cheese a bit of pepper, chopped toasted pistachios ….. and if you wish more parmesan!